By Rebecca Nickols on September 28, 2012 Visit Rebecca's Website. 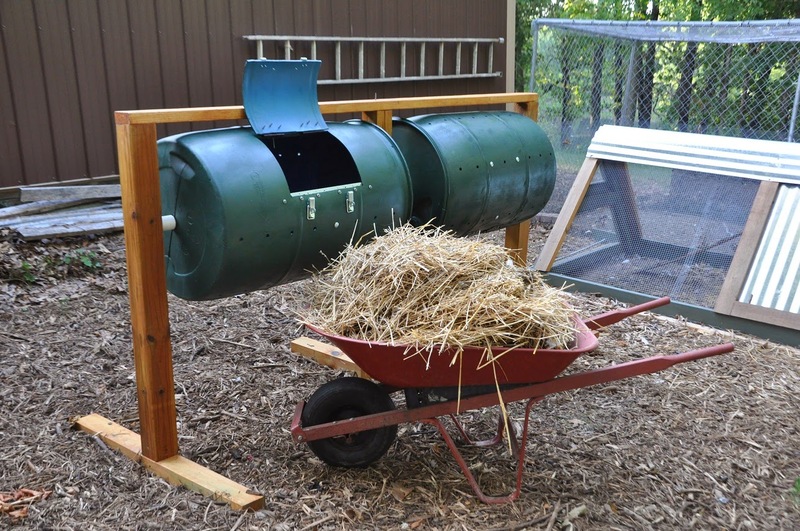 What does a DIY composter have to do with raising chickens? Well, if you have chickens, you have chicken manure … and if you’re a gardener (like me) this unlimited supply of manure can provide you with an endless supply of the world’s best organic fertilizer! 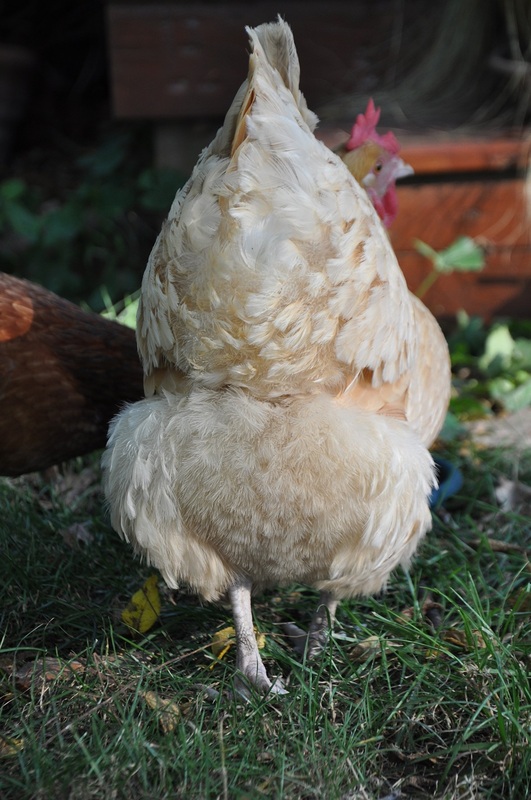 In fact, out of the fluffy backside of an average-sized hen, 1 cubic foot of manure is produced every six months! All you have to do is a little simple math to realize that it doesn’t take long before you have to contend with a mountain of chicken poop! There’s an advantage to this abundant supply of waste, though. Unlike many other backyard animals (such as cats and dogs), chicken manure is rich in nitrogen, phosphorus and potassium. To a gardener, this “black gold” is a highly sought after organic fertilizer … but to a chicken keeper who enjoys gardening, it has another advantage: It’s free! 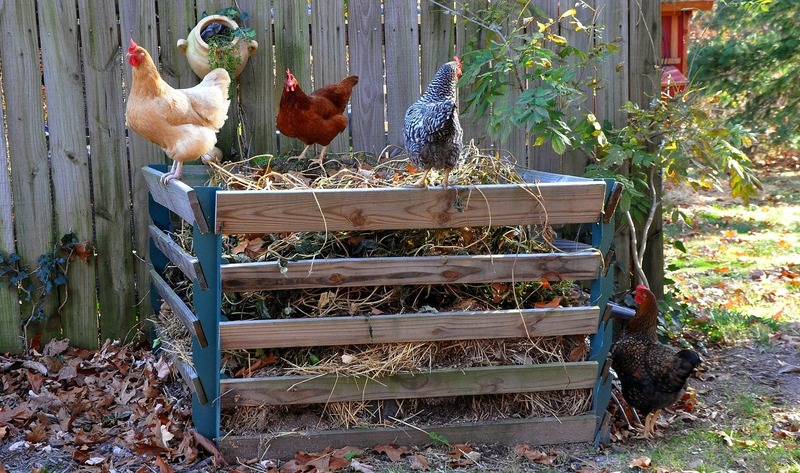 Even if you’re not a gardener, composting the coop bedding and manure will result in a rich soil amendment that can be incorporated into established landscapes. 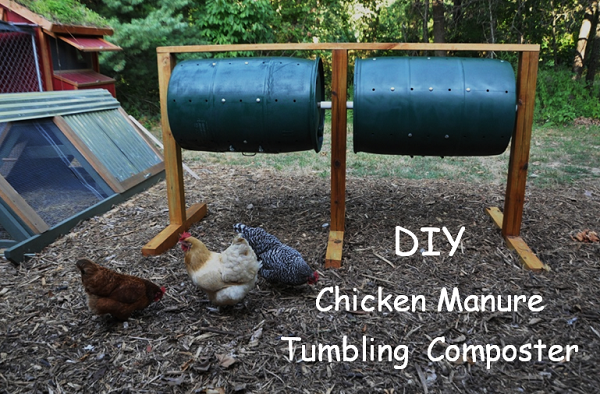 DIY: Chicken Manure Tumbling Composter! As a Master Gardener, I like to refer to the University of Missouri Extension as a reference for all gardening-related topics; click on the following link to view the university’s guide on understanding, making and using compost: “Making and Using Compost.” Mother Earth News also has a helpful article this month, “How to Make Compost.” In a nutshell, here’s my general summary of composting: Compost is organic matter that has been decomposed by a process of aeration, heat, moisture and microbes. In a chicken coop, this organic matter consists of coop bedding and manure. When composting, the general rule-of-thumb is 1 part carbon (brown, e.g., coop/run bedding) to 2 parts nitrogen (green, e.g., chicken poop). However, because chicken manure is so high in nitrogen, a 1:1 or even a 2:1 mixture might be more appropriate. How long it takes to produce compost depends on the method of composting and how diligent and devoted the gardener is in turning, watering and monitoring the temperature of the pile. If done properly, the compost could be ready to use within two to three months. Otherwise, it’s probably wise to let it age for six to nine months before incorporating it into the garden soil. A common method of composting is a simple heap or pile, or a constructed compost bin. Coop bedding and manure are added in layers to the bin and a third layer of microbe-rich soil or compost can also be added to help start the decomposition process. Adding moisture or water to the layers (material should be about as wet as a well-wrung sponge) will increase the internal temperature of the pile. 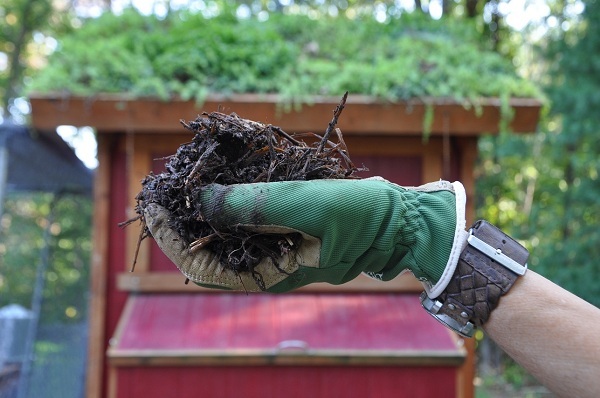 It is recommended that the compost pile heat to 130-150° F and maintain that temperature for three days. Continue turning, watering and monitoring the temperature until the entire pile has been through the heating process. Then wait … Let the compost continue to age another three to six months; it should be dark, crumbly and “earthly” smelling (there should be no odor of manure). It will keep rodents and raccoons out of the compost. As compared to a heap of rubbish, a tumbler has more curb appeal. 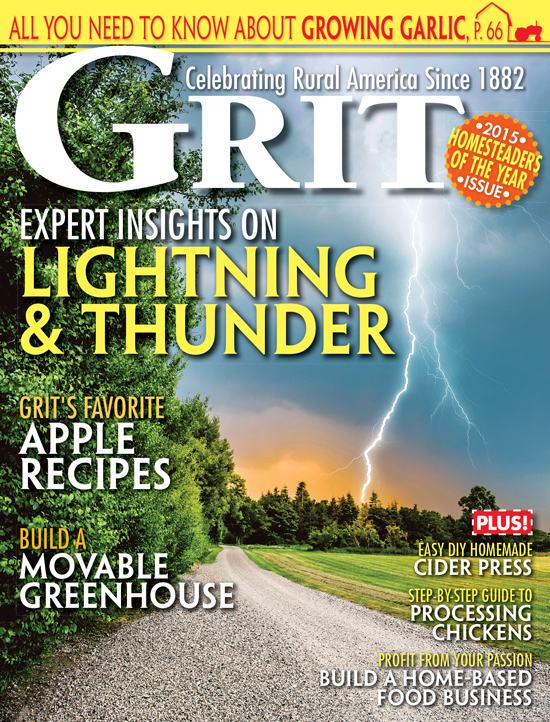 Even though the benefits seem appealing, Mother Earth News did a review on compost tumblers a few years back and came up with the conclusion that a properly attended compost heap worked just as well. However, if you’re similar to me, you don’t have the time, desire or the muscle it requires to properly attend to the compost bin! With this easy-to-do method, I’ve produced better compost in three months than I have in all the years I’ve been gardening! My husband estimated that we spent $150 on the tumblers (which seems like a lot of money). But when I priced a non-DIY alternative, they run around $150 a piece. Because we constructed two, we did save a little money and, anyway, I love the finished product! Mark the rectangular outline of the access door. This is the entrance you will use to add and remove materials. This is also a good time to mark the position of the hinges (on the top of the door) and the latches or hasp (at the bottom) that will be used to keep the door shut. Using a jig saw, cut along the marked outline of the access door. 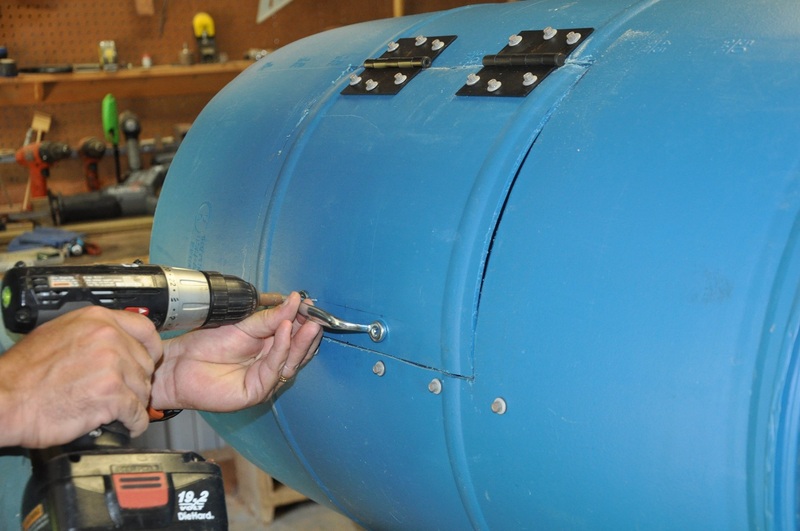 Using metal roofing screws, add a 17 1/2-inch metal strip to the bottom inside of the opening. This strip will add some support to the door and keep it in place. 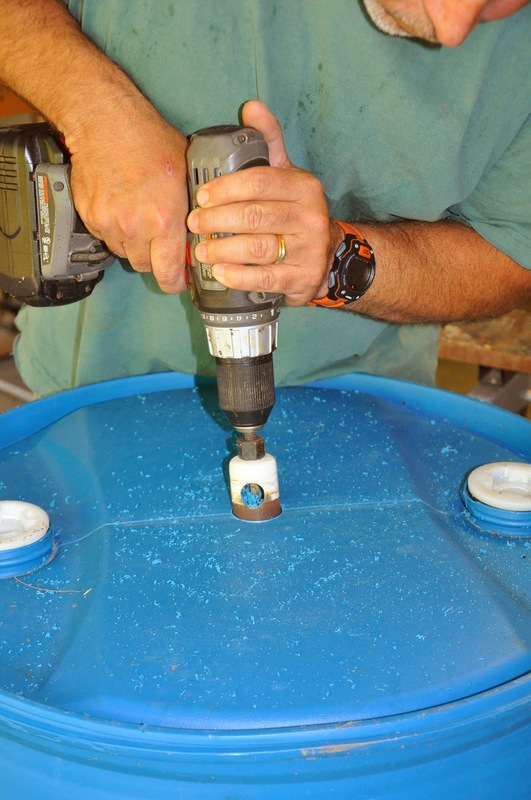 Add hinges to the top of the drum and latches or a hasp to the bottom of the access lid (to keep the lid securely closed). 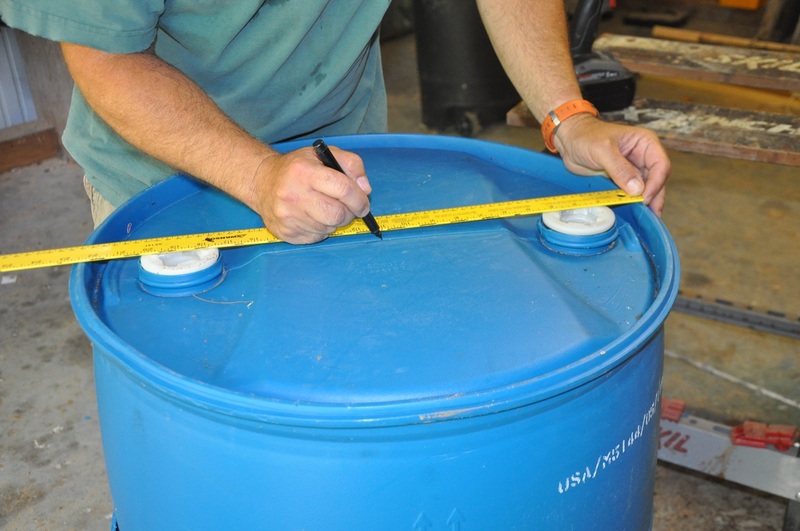 Measure and mark the center of the top and bottom of the drum. 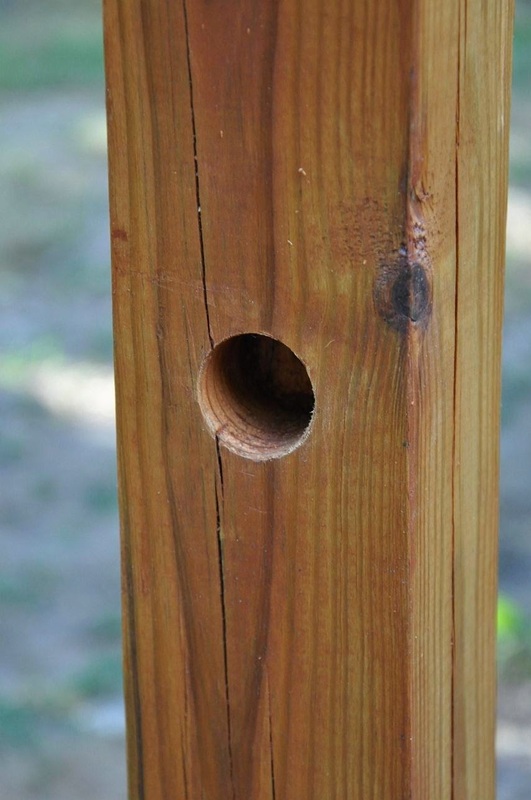 Using a forstner, spade or a saw drill bit, drill holes large enough for the pipe you are going to use for an axle. 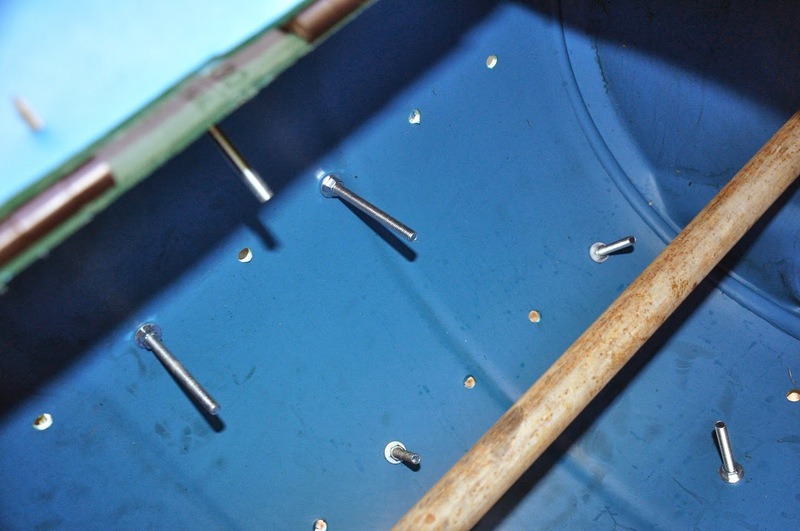 Insert 4 1/2-inch bolts, washers and hex nuts to a few of the predrilled holes to aid in mixing the compost (or to keep it from rotating as one big clump). 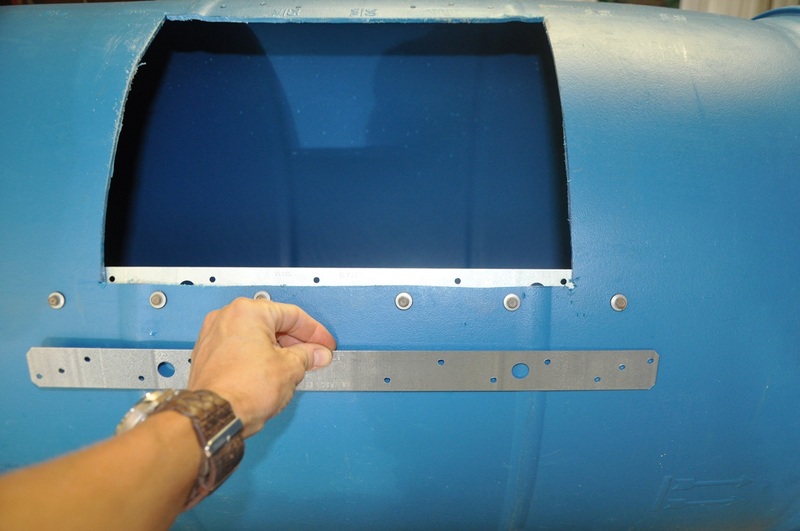 This can also be accomplished by adding an additional pipe or fin to the inside of the drum. • Step 7: Making the Compost! One of the features of the tumblers that I appreciate is that they’re the perfect height for a wheelbarrow to be rolled under the access door to either add materials or remove compost! For the first batch of compost, I only used coop bedding (straw) loaded with chicken manure. I added water as needed to the future compost and gave the barrel a few turns each day. During the first couple of weeks when I opened the lid to check of the condition of the compost, the heat was intense! At first the odor of chicken manure was noticeable, but after a few weeks the aroma was the sweet smell of compost! In two short months, the straw and manure had been recycled into a dark, rich compost! As for the tumblers … Why two? When one tumbler is full, I water it down and then start turning it for a few months. During the months that I’m spinning one tumbler, I’m filling up the other one! 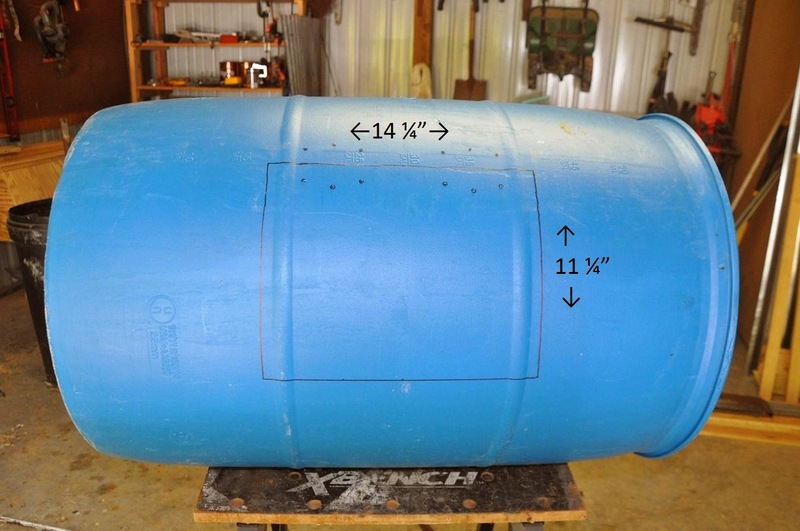 I spray-painted them a dark green for two reasons: The dark color absorbs more heat, which aids in the process, and I liked the way it looked … If you decide to spray-paint the barrels, sand the drums first, even if the paint can states, “No sanding or priming required”! FYI: The paint doesn’t adhere to the plastic without sanding first. One other thing I Forgot to mention in my post, to make the Bolts mix the stuff in the tumbler better you can add “blades” or “rakes” to them to help mix things up and help aerate it more. 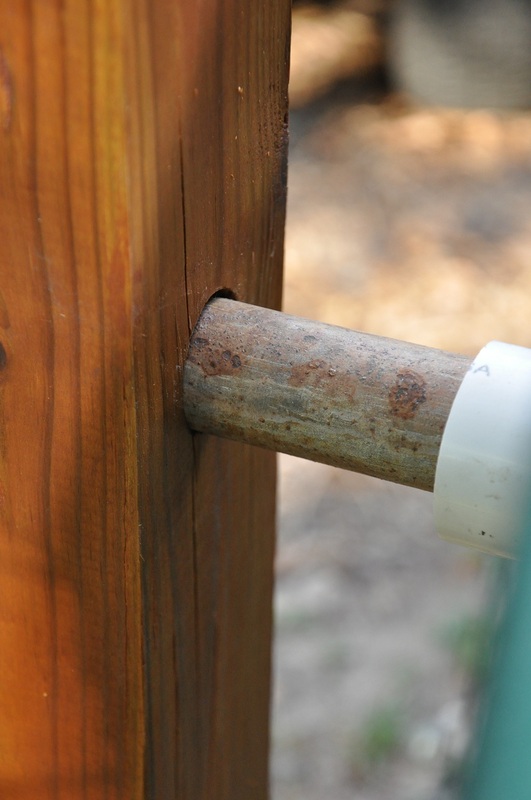 If you do add them you might want to add heavier bolts or use metal rods and attach the “blades” or “rakes” to them. To make the door a little more stable and not warp you can add some support along the edges of both the door and the barrel where the door was cut out. Or try using a thicker barrel to begin with. Also you can add a “screen” to the door to help give it some more support and will also help to sift/screen out thicker pieces that did not get fully decomposed, when you want to empty the bin out! I saw at least one of the “commercially available versions have that. 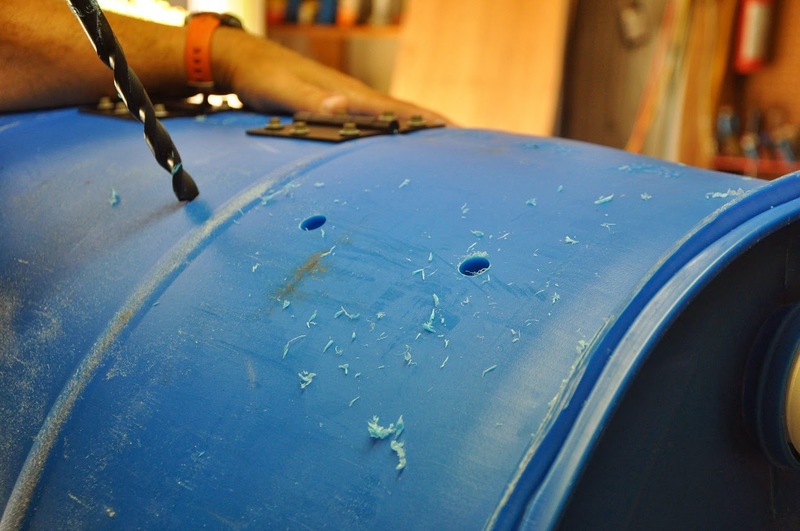 What grit would you recommend for sanding the barrels? Thank you so much! I have six young hens(6 mos) and one started laying eggs two weeks ago. The other five don’t seem to be interested in Laying eggs, will they soon start laying eggs also? I live in Southern Arizona and it is 104-107 degrees everyday, is this slowing them down? They will certainly start laying eats soon. So soon. So So soooon. Enjoy those eats. Question…I built one of these but the door kept curling and is difficult to close. I used a heat gun to soften, re-shaped and let cool. Again it began to curl. How did you keep yours in such a nice shape? Hi! Won’t the compost material fall out of the holes on the side of the drums whenever you turn them? This is brilliant! I can’t believe I paid over $500 for our ComposTwin, which is almost identical to yours. It’s lasted us for over ten years so far, and yours looks equally as well made. You just can’t beat the black gold that comes out of it! gary lovell. I took a shop hammer and flattened five of the 1/2 bolts on the end,an drilled 2 3/16 holes on the flat spots.I then took small machine bolts and bolted on 1-1/2by 3in. alum blades.these (paddles)work better in mixing the compost material. (I made the paddles out of scrape alum. We had originally planned to add a lever or handle to the barrels, but they are easy to turn just by grabbing hold of the sides and giving them a spin. How do you turn them? Is there a lever for that or do you just roll them with your hands? 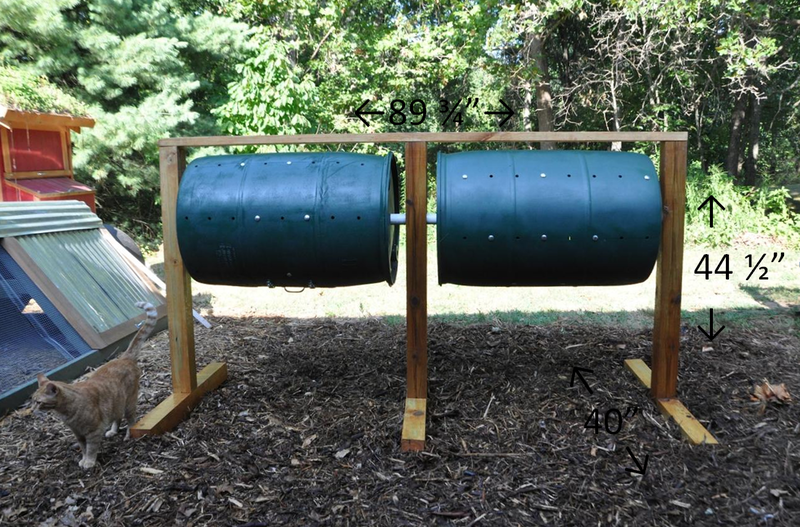 Your compost tumblers are beautiful! Good job. I’m wondering if my husband would be up to the task. Could be a good weekend project.